Tokyo Dome Live in Concert is a live album by American hard rock band Van Halen, released on March 31, 2015. It is their first live album with original lead vocalist David Lee Roth, and second live album overall, after 1993's Live: Right Here, Right Now. The official press release announcing the album arrived on February 5, 2015. This was only after the information leaked a couple days earlier and after months of speculation. The album is Van Halen's first live album with their original lead singer David Lee Roth and current bassist Wolfgang Van Halen. The album features songs from every Roth-fronted Van Halen album, including their 2012 release, A Different Kind of Truth. However, Roth's vocal performance on the album has been criticized. According to Eddie Van Halen, the band originally wanted to remix 25 original song demos that Van Halen had done before they were signed to a major label, however, the original tapes could not be found. They then considered releasing recordings of their early club performances, but the sound quality was deemed too poor. As a result, it was decided to choose a concert recording from their A Different Kind of Truth Tour. According to Eddie, they had a Pro Tools workstation attached to their mixing board each night of that tour. David Lee Roth – lead vocals, acoustic guitar on "Ice Cream Man"
^ Stephen Thomas Erlewine. "Tokyo Dome in Concert". AllMusic. ^ "Van Halen's Definitive Live Album & Remasters — FULL DETAILS". Van Halen News Desk. Retrieved 7 February 2015. ^ "CRR Review - Van Halen - Tokyo Dome in Concert". Classicrockrevisited.com. Retrieved 2018-08-05. ^ "Eddie Van Halen Speaks! Five Things We Learned in a Rare New Interview". Ultimateclassicrock.com. Retrieved 2015-06-20. ^ Ryan, Gavin (April 11, 2015). "ARIA Albums: Spirit Of The Anzacs Is No 1". Noise11.com. Retrieved April 11, 2015. ^ "Ultratop.be – Van Halen – Live - Tokyo Dome in Concert" (in Dutch). Hung Medien. Retrieved April 12, 2015. ^ "Ultratop.be – Van Halen – Live - Tokyo Dome in Concert" (in French). Hung Medien. Retrieved April 12, 2015. ^ "Dutchcharts.nl – Van Halen – Live - Tokyo Dome in Concert" (in Dutch). Hung Medien. Retrieved April 12, 2015. 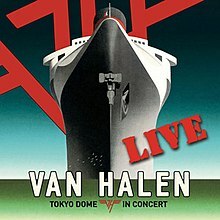 ^ "Lescharts.com – Van Halen – Live - Tokyo Dome in Concert". Hung Medien. Retrieved April 12, 2015. ^ "Officialcharts.de – Van Halen – Live - Tokyo Dome in Concert". GfK Entertainment Charts. Retrieved April 12, 2015. ^ "Swisscharts.com – Van Halen – Live - Tokyo Dome in Concert". Hung Medien. Retrieved April 12, 2015. ^ "オリコン週間 CDアルバムランキング 2015年03月30日〜2015年04月05日 11〜20位". Oricon.co.jp. Retrieved 2015-06-20. ^ "Official Scottish Albums Chart Top 100". Officialcharts.com. Retrieved 2015-06-20. ^ "Billboard 200 Chart Moves: Ed Sheeran Scores His Second Million-Selling Album". Billboard.com. Retrieved 2015-06-20. ^ "Top Rock Albums". Billboard.com. 2015-04-18. Retrieved 2015-06-20.